Intelligentsia was able to maintain the warm lighting of their coffee house with better, more efficient LED lighting. Intelligentsia’s original location opened its doors in 1995. 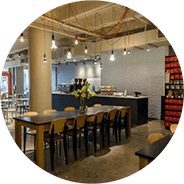 Nearly 18 years later, Intelligentsia’s commitment to supply their customers with the highest quality product and award winning service has created one of the most respected brand names in the coffee and tea industry. While they now operate in many cities, their Broadway location in Chicago’s storied Lakeview neighborhood is still home. They gave Broadway a face lift by partnering with architectural firm Wheeler Kearns in April of 2013. The renovated coffee shop is a refreshing space along with a new “back bar” allowing for twice as much seating. Intelligentsia used the opportunity while remodeling their original location to retrofit their existing lighting with LED lighting. This project had a variety of lamp types, from PAR 30s to T8 tubes and a multi-directional LED all with lower wattages compared to traditional lighting solutions. The majority of the project consisted of PAR30 LED flood lights at various beam angles for their new “back bar” track lighting. While leaving the same warm feeling of a coffee house this Verde Solutions retrofit gave the remodeled space a modern look by using modern lighting. Although going under construction can be extensive, a smart remodeling choice when it comes to lighting is Verde Solutions. Intelligentsia used Verde LED lighting to re-vamp their landmark store and realized significant savings with LEDs. Compared to their existing lighting, Verde Solutions will reduce their annual light energy by 75% and a total life cycle savings of $8,714!